What do you think about Kyklos or anacyclosis, the cyclical theory of political evolution? 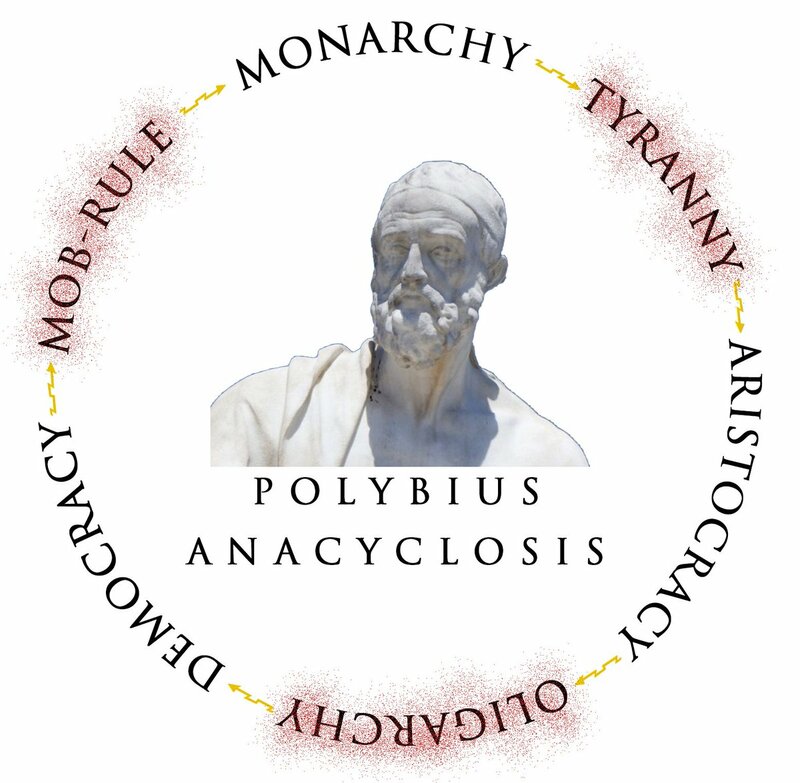 "According to Polybius, who has the most fully developed version of the cycle, it rotates through the three basic forms of government, democracy, aristocracy, and monarchy and the three degenerate forms of each of these governments ochlocracy, oligarchy, and tyranny. Originally society is in ochlocracy (government by a mob; mob rule) but the strongest figure emerges and sets up a monarchy. The monarch's descendants, who because of their family's power lack virtue, become despots and the monarchy degenerates into a tyranny. Because of the excesses of the ruler the tyranny is overthrown by the leading citizens of the state who set up an aristocracy. They too quickly forget about virtue and the state becomes an oligarchy. These oligarchs are overthrown by the people who set up a democracy. Democracy soon becomes corrupt and degenerates into ochlocracy, beginning the cycle anew. Plato and Aristotle have somewhat different beliefs. Plato only sees five forms of government. Aristotle believes the cycle begins with monarchy and ends in anarchy, but that it does not start anew. He also refers to democracy as the degenerate form of rule by the many and calls the virtuous form politeia, which is often translated as constitutional democracy. Cicero describes anacyclosis in his philosophical work De re publica. Machiavelli, writing during the Renaissance, appears to have adopted Polybius' version of the cycle. Machiavelli's adoption of anacyclosis can be seen in Book I, Chapter II of his Discourses on Livy." Which one are we in now Burt? About to lapse into mob rule. I saw some that say that this would be plutocracy, which would fit, too. See, I disagree with this entirely--in terms of who actually controls the levers of power--as well as with the suggestion that we were previously in democracy. I think we're solidly transitioning from aristocracy to oligarchy. Been all about Kierkegaard lately. I kinda ignored him because I figured he had been improve upon by later existentialists, but now it seems that he nailed a lot things. I've been lost in the infinite too long. "Anxiety is the dizziness of freedom."